Nestled in the vibrancy of the famous Nagoya Hill area, Goodway Hotel Batam is located in close walking proximity to the premier shopping and entertainment district. It offers you accommodation with a comfortable, warm and relaxing ambience. Whether you are on a business trip or leisure, we are dedicated to make your stay a delightful and unforgettable one. 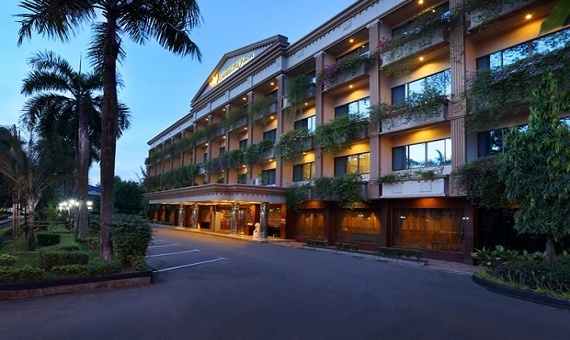 Goodway Hotel Batam conveniently features 268 rooms and suites along with full amenities, warm personal services and hospitality. As one of the Top M.I.C.E Hotels in Batam Archipelago Island, Goodway Hotel Batam offers you meetings and wedding venues up to a capacity of over 1000 people. Meetings and wedding occasions at Goodway Hotel are fully supported by our catering and banquet team, who will ensure everything you need for an exquisite occassion will suit your taste and budget. Selection of authentic Japanese fare, Indonesian dishes and Asian cuisines awaits you at our restaurants and bars, passionately made by the expert chefs. Goodway Hotel Batam also offers access to the nearby Nagoya Shopping Mall and "Kampong Bule" for night entertainment and other Fast food establishments surrounds the hotel.